The research carried out during the three years of my Ph.D. course has been focused on solid-state radiation sensors, and more precisely on silicon pixel detectors. 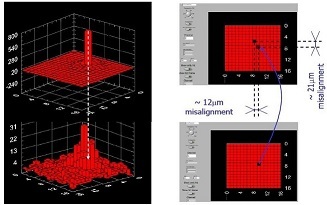 Pixel based sensors offers several advantages over the more traditional silicon microstrips or other position sensitive detectors, among which the inherently 2-D coordinate measurement that, joined with the small sensitive volume, leads to a true 3-D point in space. The pixel size could also be reduced to reach small intrinsic spatial resolution values (order of micron or less). 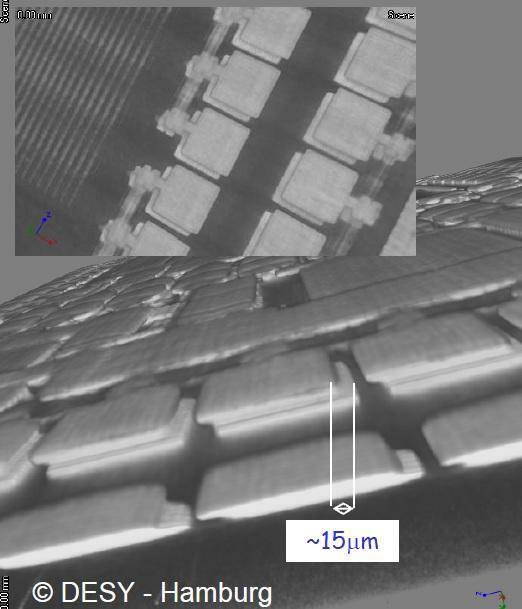 The subject of my activity has been the characterization, through the development of innovative methodologies and instruments, and design and optimization of different flavors of pixel sensors, read-out by standard CMOS technology, either as a separate chip than integrated on the same silicon substrate of the sensing element, for the detection of different types of ionizing radiation. Several classes of sensors have thus been studied, from the well known Hybrid Pixel Detectors, to the CMOS Active Pixel Sensors, to the modern many-tiers pixel detectors developed using a 3D Vertical Scale Integration technology. Complex test setups have been developed as well as dedicated algorithms to extract the important parameters of each sensor, among which Equivalent Noise Charge, Signal to Noise ratio for Minimum Ionizing Particles, detection efficiency and spatial resolution. A modified grazing angle method with medium energy charged particle beams (i.e. few hundreds MeV electrons) has been developed to probe deeply the sensor characteristics, opening the possibility to carry out precision measurements of the interaction between ionizing radiation and matter, and of physical processes with unprecedented accuracy. Applying this technique some electronic properties of silicon pixel detectors have been measured, like diffusion coefficient, carriers lifetime and charge collection efficiency profiles.